After the demise of the Mille Miglia in 1957, the 24 Hours of Le Mans became the primary focus of Ferrari's racing efforts. The configuration of a car that would meet the new rules was partially influenced by a desire to sell cars to privately sponsored teams. Ferrari 250 Testa Rossa no.0724 TR, sold to Jacques Swaters's Belgian Equipe Nationale Belge (ENB) team in February 1958, was one such car - the ninth of a total of thirty-four Testa Rossas built. 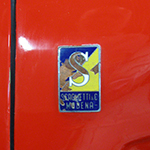 This Scaglietti-designed, pontoon-fendered, left-hand drive version was painted Belgian yellow with a red stripe running nose to tail. Swaters displayed his fresh-from-the-factory TR at the Brussels Expo in March 1958. Over the next few months, ENB raced it with some success at various tracks in the UK. By June, chassis 0724 TR was being freshened for the all important Le Mans 24 Hours, the point in time represented by this restoration. An accident on lap 33 ended the Le Mans expectations for car number 58. 0724 TR was returned to the factory for front end and body repairs before being purchased by and shipped to Luigi Chinetti in New York City. It was raced in the US by multiple owners/drivers until 1961, when the engine and gearbox were separated from the chassis. The engine was installed in a Maserati Birdcage T61 and subsequently sold. The chassis was purchased as-is, and the new owner (Dr. Willis Murphey) had a Chevrolet Corvette V-8 engine and an American rear axle installed, along with some minor bodywork changes. He raced it on and off in Texas from 1962-1984. In 1995, Murphey was able to purchase the original engine (nr.0724 TR) before reluctantly selling the entire project in 2011. The extended racing career in both Europe and America left the expected scars of the many battles fought. Despite this, the 50 year stewardship by a single owner prevented the frequent personalizations multiple owners can inflict on a car, leaving a remarkable amount of information to build on during our thorough and authentic frame-up restoration. Original details such as the colors and locations of the body paint, modifications in preparation for the Le Mans race, and a complete and very rare soft top, were uncovered during disassembly. Historic documents and photographs were critical while pursuing the treatment of the door hinge dimples and the dissimilar exhaust openings, and the post-scrutineering changes such as the relocation of the fog lights and the engine access door cut into the hood.